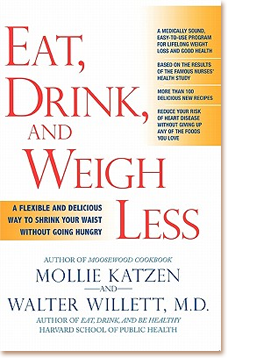 Here's the dream team for healthy eating: Mollie Katzen is the author of the landmark Moosewood Cookbook and one of Health magazine's five "Women Who Changed the Way We Eat;" Dr. Walter Willett is the head of the Harvard School of Public Health's Department of Nutrition and the world’s most cited authors in clinical medicine. Together they’ve created a weight-loss plan that's not only easy to implementwith gradual shifts rather than quick fixesbut filled with delicious, enjoyable foods and more than one hundred of Mollie's fabulous recipes. To cater to those with a busy lifestyle, Willlett and Katzen offer a portable plan made largely of ready-to-eat and easy-prep foods. The book provides several supporting tools including a handy grain-cooking guide, shopping guide and tips on eating well through life's ups and downs. "A commonsense, science-based book on nutrition that you can trust." "I recommend this remarkable collaboration with wild enthusiasm." "The best book on nutrition for the general public." "There's no starvation on this diet." Eat, Drink and Weigh Less provides sound nutrition information and advice based on scientific research. Designed to teach the reader how to achieve and maintain a healthy body weight for life, the book is packed with practical tips and tools to help with weight management and overall health. In addition, the authors take time to educate the reader about the importance of the principles outlined.